The meteorologists have divided clouds into different categories on the basis of their shape and height. There are certain clouds that do not fall in this category and are given names under the weather conditions in which they are formed. Out of all the types of clouds, stratocumulus clouds seem to the most common one. It is given an abbreviation of Sc and tends to form thick masses of clouds. Their shape, density, height and uniformity change with respect to each cloud that falls in stratocumulus category. One of the many types of stratocumulus clouds is stratocumulus perlucidus clouds. The detailed information on this type of cloud is discussed below. What are stratocumulus perlucidus clouds? 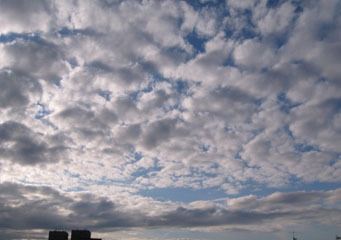 Stratocumulus perlucidus clouds can be seen in the form of layers that have small spaces in between. They are not thick clouds and you can easily see higher clouds or clear sky above them. Although they form layers but there is no uniform pattern of these clouds. Just like the name suggests, stratocumulus means lumpy and these clouds have lumpy irregular appearance. The word perlucidus means that the light goes around it as they do not cover the sky. Those who can understand Latin will not have any difficulty in recognizing the shape of this cloud as the Latin name is self-explanatory. How are stratocumulus perlucidus clouds formed? Stratocumulus perlucidus clouds are quite flat in nature and are formed because of the weak air convection currents. The air is relatively dry and stable that prevents vertical development. This is the reason why these clouds are shallow. They have a very distinctive pattern which makes them quite different from the other types of clouds. They also develop in wind streams and move in the direction of the wind. The most important feature about these clouds is that as they drift over the land, they tend to reduce cold and summer heat. You can expect dull weather when you see them over casted in the sky. What height are stratocumulus perlucidus clouds found? Since, stratocumulus perlucidus clouds do not experience any vertical developments; they are classified under the low level clouds but are larger than altocumulus clouds. These clouds have a maximum altitude of sixty five hundred feet. What do stratocumulus perlucidus look like? As the name indicates, the stratocumulus clouds are a fine combination of stratus clouds and cumulus clouds. They have layers like stratus clouds but they comparatively thicker and the layers are close to each other. On the whole, the shape of the stratocumulus perlucidus clouds is determined by the wind forces and the condensation process. They are generally layered with sheet like formations. Low level clouds are seen in light grey shades and the same applies for stratocumulus perlucidus clouds. They have a strong association with fog and precipitation. How common are stratocumulus perlucidus clouds?